Aroi Thai opened in March 2008 becoming the first Thai restaurant in Nantwich, Cheshire. The market town is rich in history and culture, offering beautiful timber framed buildings along with a diverse range of specialty shops. Nantwich provided the ideal location for us to share our knowledge and passion of the great authentic Thai food with its exciting mix of colours and spices. 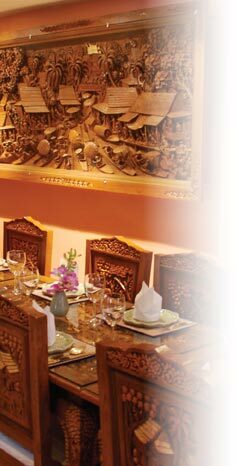 The Aroi Thai restaurant has been lovingly furnished with hand carved teak wood furniture and wall carvings, bought from Chaing Mai in the north of Thailand which is the centre of the Thai wood carving industry. Every chair, table or wall carving have been ornately carved and designed to displaying a different scene so no two pieces of furniture are the same. Please see our gallery pages to view the amazing skill and craftsmanship which has gone into creating each masterpiece. On display within the restaurant are paintings by elephants from the world famous Maesa Elephant Camp, Chaing Mai. This like the beautiful furnishings have to been seen to be believed, how such large and powerful animals can create such delicate works of art. 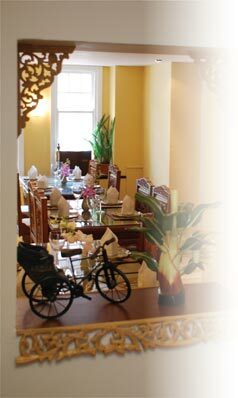 Sharing our passion for Thai food has been key to our success. We pride ourselves on delivering freshly cooked authentic dishes created by selecting only the very best locally sourced ingredients, where possible. Our hand-picked international experienced chefs combine these with their many years of experience to create truly delicious authentic Thai food.